Robin Hemley, like most adults, has never been satisfied with his childhood. He made mistakes: he messed up during the school play, he didn't ask out the girl he liked, he didn't try very hard to be a good student, or even really a good person. Like the rest of us, he overcame his childish ways and became an adult — but he continued to be haunted by those failings of childhood. Robin, however, went further than the rest of us: he went back and had "Do-Overs". 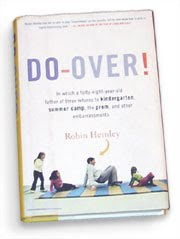 In his book, Do-Over!, Robin Hemley documents his attempts to repair the mistakes and errors of the first two decades of his life, starting with Kindergarten, through summer camps (first appearing in New York Magazine) and various other schools, ending at resolving a failed experience as an exchange student in Japan. As his project grows and evolves, his real life hasn't stopped moving, either, and his family changes and grows alongside his back-tracked years. The book isn't a good study in re-living the past: as it progresses, the Do-Over plan begins to fade, and it develops into a study on how Robin got to where he is today. Having messed up his Christmas play is a well-defined event to try and do-over, but staying at his childhood home and having dinner with his mother's friends amplifies the more personal aspect of revisiting childhood. By the end of the book, when Robin travels to Japan to relive an aborted exchange student school-year, it has lost the aspect of Robin pretending to be a high-school student, replacing the mechanical do-over method with grown-up days hanging out with a long-lost friend, driving around Osaka, and reminiscing with the chain-smoking Japanese head of the exchange program. Those reflections on Robin's youth are the more intriguing stories in the book, but they lose the momentum of the kindergarten or Christmas play chapters. When Robin is working towards a goal, overcoming the obstacles both internal and external, the reader is remembering their own childhood mistakes and rooting for the underdog Hemley. It is easy to identify with the guy who wasn't the most athletic, or the smartest, or the Cool Kid. You want him to do his lines correctly or to sit with the football clique at lunch, using the benefit of adulthood to accomplish what seemed impossible to a kid. Robin continually re-discovers that childhood isn't, technically, lost in age — he quickly falls into regressive behaviors, unconsciously behaving more like an 11-year-old when living as one than he had expected. As Hemley wanders away from redoing experiences into reliving memories, he has a chance to reflect on what the do-overs mean to him, aside from a goal of replacing a failure with a success. At its best, the book is The Autobiography of Robin Hemley, written not from memories composed in a past tense, but through the New Journalism lens of his experience physically revisiting what was distantly remembered. The book, however, is pulling in different directions throughout, and doesn't completely get its bearings on where the Do-Over project is headed. This lack of a cohesive destination, whether intended or not, weakens the book, because it's a different experience to cheer for a character beating the odds versus sympathizing with a man who begins by describing himself through the 'glass half-empty' memories of his childhood. Robin says throughout that he repeatedly received positive feedback when explaining his project's conceit, but when the book leaves behind those do-over goals it starts to be about the difference between recalling flawed memories of the past and reflecting on what those experiences make of a man.